Who knew Bing Crosby was the Godfather of the Canadian Tuxedo? Turns out he is. According to Levi’s Archivist (how dope is that job???) 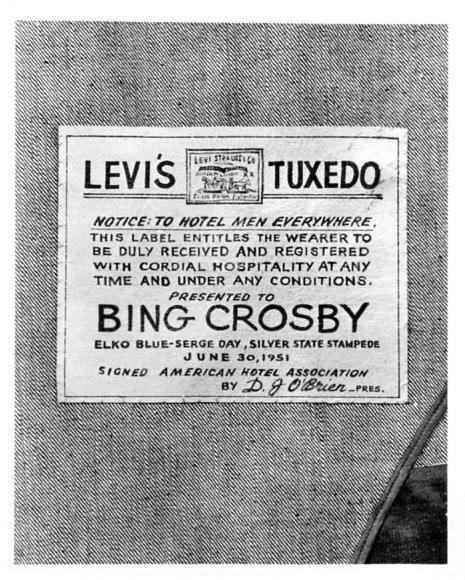 Lynn Downey via One Trip Pass, Crosby was a huge fan of the Levi’s brand, often seen in its jeans and jackets. Apparently the crooner hunted in a Canadian Tuxedo – Levi’s jeans and jacket. And after one trip in 1951, Crosby and a buddy were denied entrance to a Vancouver hotel due to the fact that they were in draped in denim, which had a sour stigma thanks to bad boys Marlon Brando and Jimmy Dean. According to Downey, Crosby returned home to tell the story, which was relayed onto Levi’s. The red-labeled denim company in turn created a denim tuxedo jacket specifically for Crosby. Who could question the class of a man dressed in a legit tux jacket, denim or not? This entry was posted on Saturday, April 9th, 2011 at 10:55 pm	and tagged with Bing Crosby, Canadian Tuxedo, James Dean, Levi's, Lynn Downey, Marlon Brando, One Pass and posted in History. You can follow any responses to this entry through the RSS 2.0 feed.